My two girls love to cook. Mostly it’s macaroni and cheese, but to help expand their culinary horizons, I got them each a book by Moosewood Cookbook author, Mollie Katzen. Five-year-old Alice got Pretend Soup, while eight-year-old Adeline got Honest Pretzels, and I have to say these books have been perfect for them and for us to cook together. The instructions are laid out as step-by-step pictures, but Katzen offers more detailed instructions for a supervising adult. She also makes it clear which parts a child should be able to do on their own and which parts might require an adult’s help: uncovering the pot and deciding if the liquid is hot enough, setting up the blender, taking the pureed soup out of the blender. These are great reminders for me to go ahead and let them chop things up, stir things in a hot pot, mash the button on the processor. How else will they learn if not by doing? When I manage to be organized and create a weekly meal plan (man, I feel like a rock star when that happens! ), I ask the girls to each pick a recipe. 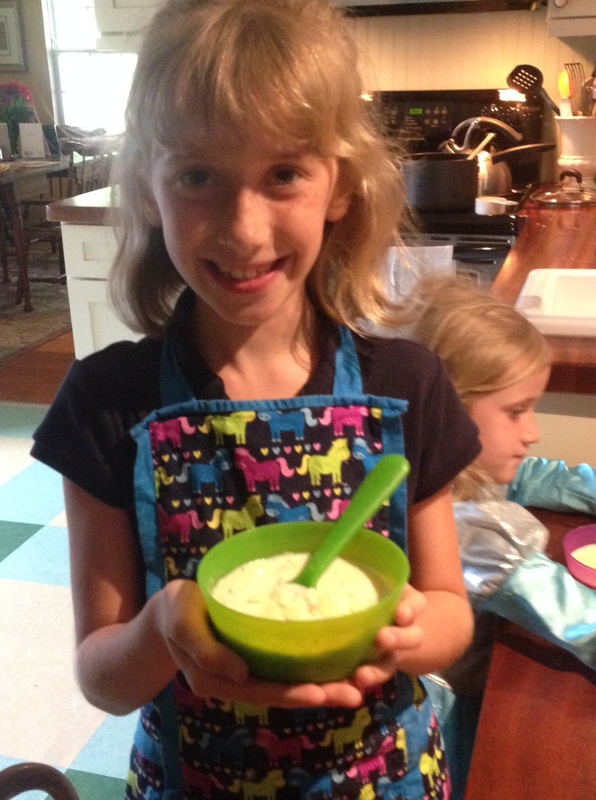 For her first selection, Adeline chose Creamy Corn Soup. And we made it together. Look at that proud face! She was thrilled to serve it to the family, and you know what? It was good! Not made-by-my-own-child-so-I-have-to-act-like-i-like-it good. Like, honest to goodness tasty! It was fresh, healthy, perfectly balanced between light and filling, and inexpensive. Pretty much perfection, no? Melt the butter in a medium-sized saucepan on low heat until melted. Add the scallions, celery, corn, salt and basil. Increase heat to Medium and cook for about eight minutes. Add the broth and heat until it begins to boil. Reduce heat to low and cover the pot. Let cook covered for five minutes. Return to saucepan to reheat if needed and serve with a little shredded cheese garnish.